The president told Syria and Bashar Assad that the cost of using chemical weapons is going up and may get personal. Friday night’s multinational raid on Syria’s chemical weapons infrastructure was well planned, well conducted and by all reports effective. There were apparently no casualties and no mistaken hits on Russian forces, and the raid seems to have been a textbook example of a surgical strike. The justified and proportionate action had broad international support and bipartisan political backing inside the United States. The raid was punitive, punishing the Assad regime for conducting illegal and inhuman chemical attacks on civilians. More important, the raid was intended to have a deterrent effect, to convince Syrian decision-makers that it would be unwise to conduct any future such chemical attacks, in which case they would pay an escalating price. It is instructive to compare Friday night’s raid to the 2017 response to Syria’s chemical attack at Khan Sheikhoun. The latest raid used more and varied weaponry, involved more counties, and hit more targets than in 2017. Significantly, the targets were higher up the system — not just aimed at the units that conducted the attacks like in 2017, but at chemical weapons stockpiles, a research, development and testing facility, and a command post. Friday night’s raid even touched the center of the highly defended capital Damascus, telegraphing to the Syrians that they have nowhere to hide. The implicit message to the Assad regime is that if chemical weapons are used again, the response will involve even more weapons and potentially more countries, and hit targets even higher in the system. These could include senior military command and control nodes and government decision-makers. Ultimately, this chain of escalation leads to Bashar Assad himself. If he continues to use chemical weapons, he will have to wonder how many steps there are between the latest raid and one that could potentially put him in the crosshairs. The Damascus regime should reflect on the fundamental disutility of chemical weapons. They are rightly abhorred by the international community. They are of questionable battlefield use, indiscriminate, unpredictable and contaminating, usually employed where fronts are relatively static such as in World War I or the Iran/Iraq War in the 1980s. They are also used as terror weapons, such as during the latter conflict when Iraqi official Ali Hassan al-Majid, aka “Chemical Ali,” used chemical weapons to punish, intimidate and slaughter Kurds who were suspected of disloyalty to Saddam Hussein’s regime. Chemical Ali was later tried by the post-Saddam government and found guilty for war crimes, crimes against humanity and genocide. He was executed in 2010. The Assad regime is following the Chemical Ali pattern, employing the weapons against civilians in rebel-held areas and whoever else is in the target zone. So a strong war crimes case can be made, both for the use of the weapons, which is illegal under the Chemical Weapons Convention, and also for the way they are being used, to murder non-combatants. Investigating and documenting these crimes will play an increasingly important role as the military phase of the Syrian civil war winds down and diplomatic efforts ramp up. The Trump administration is eager to restart the United Nations-sponsored Geneva process that will hopefully develop a framework for a more inclusive and democratic post-conflict Syria. In the long run, this is the most important aspect of American involvement in the Syria crisis, since the Trump administration rightly is not seeking to escalate direct U.S. military involvement on the ground. The strike was a limited response to a specific and illegal chemical attack. But the White House has also said that the United States would employ broader elements of national power, particularly economic and diplomatic measures. Friday night’s action should be viewed both as strategic messaging to deter future Syrian chemical attacks, and as part of a broader concept for quickly resolving the civil war on favorable terms. 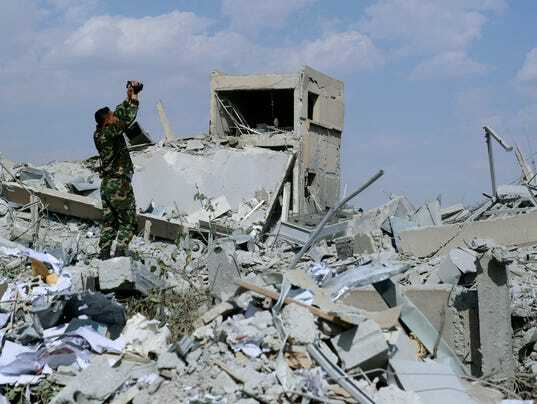 Meanwhile, the Assad regime and its allies have been given an instructive example of the vast capabilities of the multinational forces that were arrayed against them Friday, for one hour in their seven-year war. Hopefully, Damascus will take the point. James S. Robbins, a member of USA TODAY’s Board of Contributors and author of This Time We Win: Revisiting the Tet Offensive, has taught at the National Defense University and the Marine Corps University and served as a special assistant in the office of the secretary of Defense in the George W. Bush administration. Follow him on Twitter: @James_Robbins.